Maud Lewis was a quiet housemaid in Nova Scotia whose simple folk art paintings brought her gradual fame in the 1960’s. Hers is not a story of a passionate artist who fights her way to glory, or a painter whose work is discovered and their life changes forever. Instead it is a quiet story about a arthritically deformed woman who longed for love, found a version of it that worked for her, and painted for the pure joy of the act. Her bonus in life was that fame found her even when she wasn’t seeking it. Maud (Sally Hawkins) suffered both physically and mentally throughout her life. She was severely arthritic from a young age and was raised by her cruel Aunt Ida. She was forbidden from partaking in the minut town’s version of night life, and lived as a kind of prisoner. One day while fetching groceries Maud overhears a gruff, illiterate bachelor, Everett, (Ethan Hawke) ask if the shopkeeper knows of any woman who would be his house maid. She grabs his ad before anyone else sees it and is the only woman to apply for the job. Everett is cruel about Maud’s appearance, and crude in his behaviors and lifestyle. He is insistent, demeaning and demanding but she stays as it is the best option open to her. She finds a way to manipulate Everett’s mood and personality. She slowly adds feminine touches to the home and as it grows more cozy, his temperament also warms. First she adds a turquoise shelf, and then paints one small bird. By the end of her life every surface of the house is coated in her paintings. The visual appearance of the home personifies the way that their lives intertwine. This is not your typical love story. There is no outward expression of passion from Everett. He never apologizes for his early cruelty, and he uses no poetry in words or actions towards his housemate, who eventually becomes his wife. Instead this unlikely couple spend a lifetime together getting just enough of what each needs to survive in a peaceful state. Everett is yin, Maud is yang. Maud’s math skills and ability to read aid in the debt collection and repayment of Everett’s fishing and logging work, and when her paintings begin to sell it affords the couple a bit of comfort that they had never been accustomed too. Everett struggles with the attention and doesn’t enjoy having strangers around his home but a flicker of pride can be seen in his face as cash is handed to him in exchange for a painting. This is a subtle and quiet film that will play better for those who are in, or have witnessed lifelong relationships. What outsiders could deem unforgivable behavior while viewing this relationship from the outside may be missing the very nuances that make this couple choose to be together for life. Besides the rich story, Maudie has incredible costumes, score, sets and cinematography. 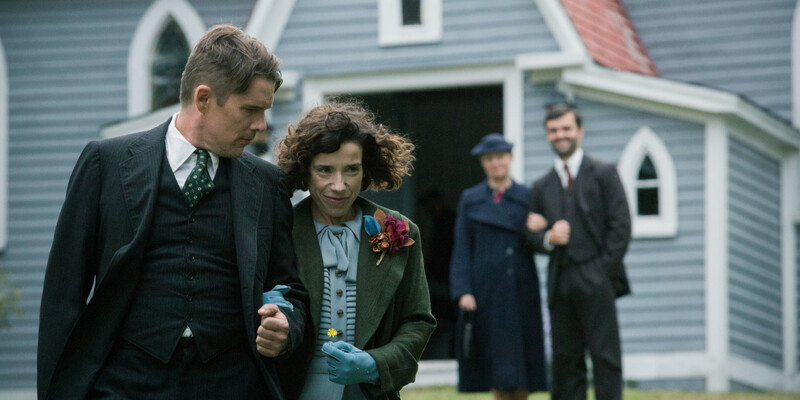 Even with so much working for it, the story would’ve fallen flat if not for the well matched and inspired performances of Ethan Hawke and Sally Hawkins. Hawke is at his best with this subtle and true performance. His harsh character will be familiar to many. This was my husband’s grandfather. He would be considered sexiest by today’s standards, and perhaps he was, but he worked hard, and lived simply, and those were his goals in life. Hawke embodies this man so completely that his gait and facial expressions are almost unrecognizable from other films. Hawkins is an actress of the highest caliber and her performance as Maud is at once touching and strong. Physically, she plays her deformity with gimping fingers and a lilting walk. The depth of her sorrow and the joy that emanates from her eyes as she paints is enchanting. Maud never sought a sweeping, epic romance. Her goal was to find someone to care for who would allow her to pursue her love of painting in her free time. Maud went through many hardships in her early life. She had and lost a baby, was all but disowned by her brother, and was shunned by much of the town in which she resided. Some would be destroyed by this but Maud chose to find joy in the daily wonders of her life, and this film might just inspire you to do the same thing. wonderful review. on my short list!